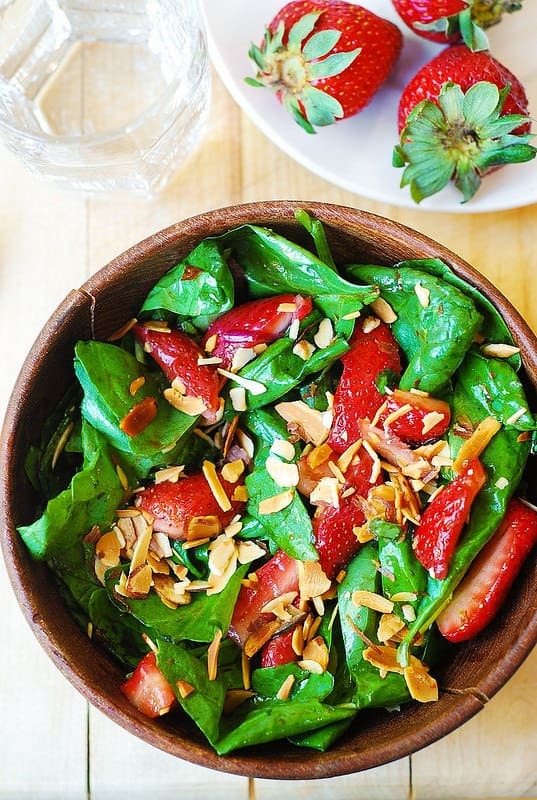 Spinach salad with strawberries and toasted almonds with a simple homemade balsamic salad dressing. Simple Summer salad. Nothing complicated. Only 3 ingredients for the salad, and 3 ingredients for the salad dressing. It’s hard to say good bye to the Summer, and I still have some strawberries left in the refrigerator. 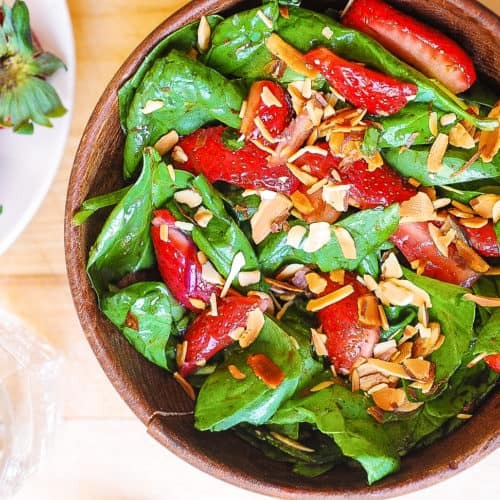 Couldn’t think of any better way to use them than to throw them into this simple spinach salad with strawberries and toasted almonds. To make the salad, just combine spinach leaves in a large bowl with sliced fresh strawberries (cleaned and hulled). Make the salad dressing in a separate bowl by combining olive oil, balsamic vinegar and brown sugar and whisking until emulsified. Or, you can add all these salad dressing ingredients to a glass jar, close it with the lid, and then shake it vigorously to emulsify the dressing in this way. Do not add all of the salad dressing into the salad at once. Add just enough to coat. Only then top with toasted slivered almonds. Tip: I like to add toasted sliced almonds AFTER the dressing is mixed in because it prevents toasted almonds from getting soggy. Spinach and strawberries pair perfectly with a sweet balsamic vinegar dressing, made with only 3 ingredients: olive oil, balsamic vinegar, and brown sugar. Simplicity at its best! 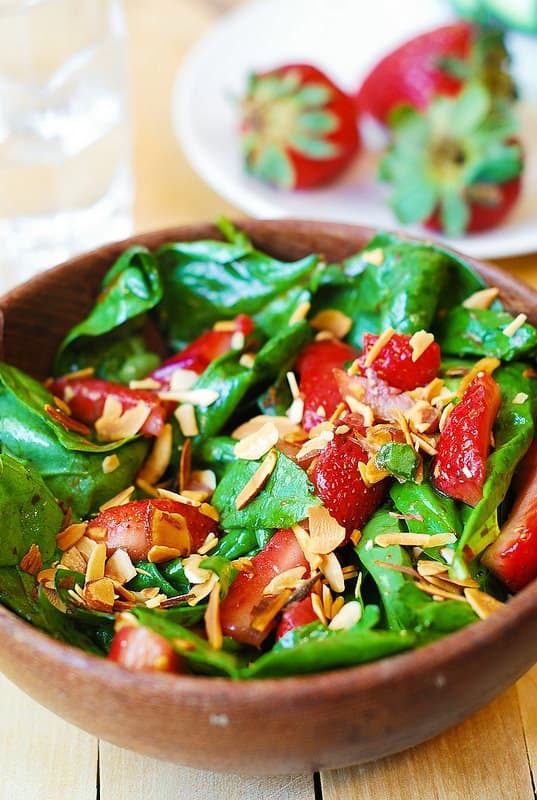 Spinach salad with strawberries and toasted almonds. Simple balsamic dressing made with olive oil, balsamic vinegar, and brown sugar. In a medium bowl, combine the dressing ingredients, and whisk together until emulsified. Add salt to taste, if desired. You can serve the dressing immediately or you can cover it and chill for an hour. In a large bowl, combine all of the salad ingredients, except the almonds. Add the dressing to the salad and toss. Do not add all of the dressing at once - add just enough to coat. Sprinkle toasted sliced almonds on top of the salad or on top of each serving. Love the strawberries in the salad! I am so not ready for summer to end! I love simple salads like this – so full of color and texture! You know, I used to be totally anti-fruit in my salad… but I’ve been coming around in the last year. I can’t imagine this wouldn’t be delicious! Easy peasy pretty and I am sure delicious.